Words have power. They shape perceptions. They trigger emotions. This morning I was reviewing a capability framework, reading skill descriptions aloud. One statement contained the word ‘articulate.’ When I read it the word just felt satisfying with it’s hard edges emphasising the sense of clarity that it alludes to. I tweeted about how it felt to say this word. Articulate is also the name of an eLearning development package, so it had a very different association and emotional impact on someone else as their reply indicates. As an aside, I like the word malarkey too. What pictures form in your head when you read this word? I think of a group of noisy cockatoos. The words we use to label objects and groups of people can convey messages or be perceived by others to contain meaning that perhaps we had not intended. 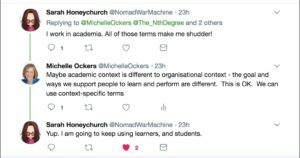 In another Twitter conversation occurring simultaneously someone was talking about ‘learners.’ Debate about use of the word ‘learners’ within organisations is not new. 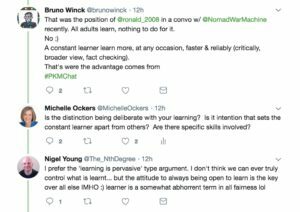 One ground for objection to the word is the point raised by Nigel Young below that learning is pervasive and simply a part of being human. Picking up on the ‘learning is pervasive’ point, I grapple with the word ‘learner’ because it reinforces the mental model that learning and working are separate activities. Clinging to this model is the antithesis of continuous learning. It impedes the critical adoption of more agile ways of learning for businesses to maintain the momentum in today’s volatile, fast-paced environment. Despite my aversion to the label ‘learners’ I find it challenging to find a suitable alternative when I need to describe a group of people whose performance and learning I’m endeavouring to support. The tweets below give some options. Interestingly, one of the participants in this conversation was from academia and had a different view on the label. My final insight is that choice of the most appropriate label depends on context. In an organisational context I shall continue to find words other than ‘learner’ wherever I can as I think it goes to the heart of a very important shift required for Learning and Development practitioners to let go of control and support continuous learning as a core part of their role. 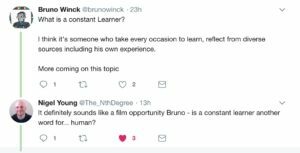 What words (if any) do you use to replace ‘learners’? If you still use the word ‘learners’ what is your rationale? 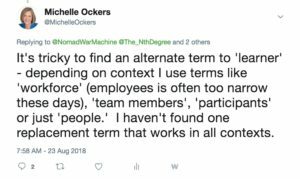 This entry was posted on August 23, 2018, 6:07 pm and is filed under Continuous Learning, L&D Transformation, Michelle Works Out Loud. You can follow any responses to this entry through RSS 2.0. You can leave a response, or trackback from your own site.